The crowd awaits the start of Tuesday’s hearing. On the wall, a map of the planned path. UPDATE: Tuesday night’s hearing was continued until next Tuesday, 7 p.m. Dec. 9 in Benton County’s Sunset Building, for more testimony. About 20 people spoke in favor of the plan for a bike trail between Albany and Corvallis, and six farmers spoke against it. 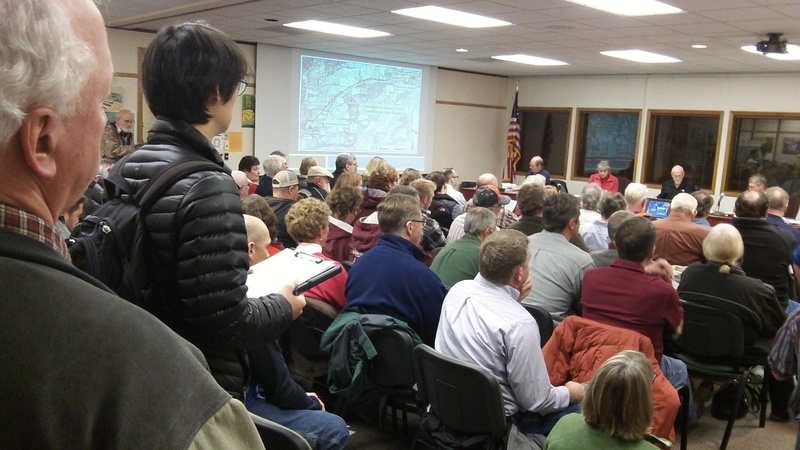 A public hearing on the planned Albany-Corvallis Bike Trail drew an overflow crowd Tuesday night. And as the hearing dragged on past its first hour, I could not help but think that Benton County might have wanted to take this important procedural step years ago. Attorney Ed Schultz, at left, making notes, represents farmers who object to the route. 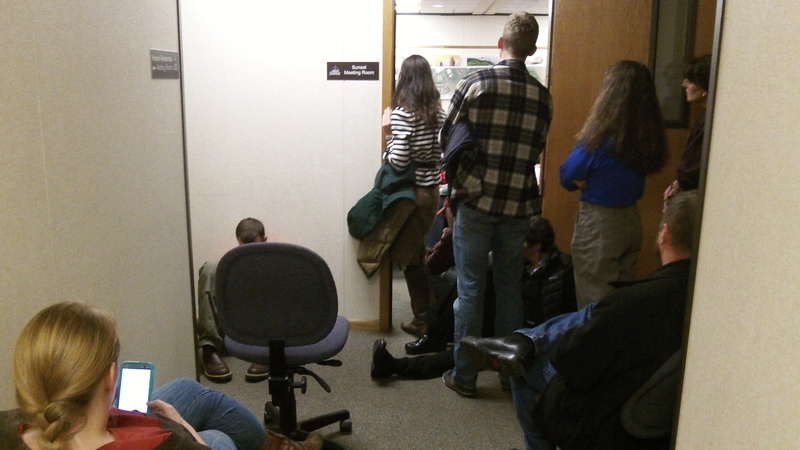 About 100 people jammed into the county’s Sunset Building meeting room in Corvallis, filling all the seats and lining the walls, and in he hallways outside another 20 or so were listening through open doors. At issue was a conditional use permit to allow the main 5.5-mile segment of the path, from near Manchester Street in northeast Corvallis to Scenic Drive in North Albany, to run across fields zoned for exclusive farm use. About a dozen farmers whose property would be affected have raised strong objections, fearing the path and its users would interfere with their operations. Ed Schultz, the Albany land-use attorney, represents some of them. Their objections are likely to delay the project and may even kill it by appealing any permit as far as they can, ending in the courts. The path was first proposed more than a decade ago, and a study in 2004 found it would be feasible. Originally, though, it was envisioned to run along the Union Pacific tracks on the railroad right of way. That idea foundered on the refusal of Union Pacific to allow it. A short section of the path near Cheldelin Middle School in Corvallis has been built, but it ends uselessly a few hundred yards from its start. Trying to listen from outside the hearing room. This is an important local issue today HH. 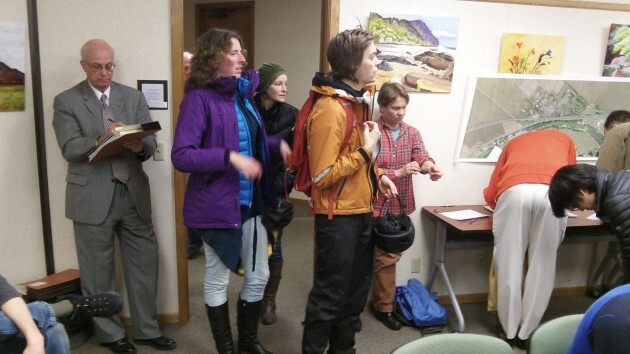 While I support a bike trail between Albany and Corvallis, this proposal is a bad one. If the courts are forced to use legal action to take land, they should do so against the RR and place the path between the RR and the highway as originally planned. Others have pointed out, rightfully so in my opinion, the bigger issue is interference with the work of farmers, more so than the taking of the land even. When a farmer crosses the path, resulting in rocks on the path, is he then open to be sued if a cyclist has a resulting fall? What about watering and pesticide spraying which will drift onto the path and folks thereon? These are not just hypothetical issues. I have read over the years, in newspapers, of complaints that occur when urban people recreate or move too close to farmers. Complaints about odors from dairys, noise from animals, with the homeowners trying to force the farmer to change his work to accomodate them. Most of us have seen this play out on the large scale by the ban on field burning — which severely impacted the farmers. So, I support a bike path between Albany and Corvallis, but I can not support this plan. Thanks for the fact checking HH. I pulled the quote more for the point that it is to stop before the dangerous curves. If that is true, then I would think the plan needs adjusted to account for the last leg into Albany in some manner that makes that portion safer. I still disagree with the current proposed burden his would put on the farmers. However, I also still support a bike/pedestrian path between Albany and Corvallis, but it seems like there has to be a better solution. I hope the farmers prevail. We don”t need to fund this special interest group on the backs of our farmers. The planners who proposed the new route should be chastised for their over-reach on the idea that local gov’t can do whatever it wants. If farm land can be condemned for the bike lane why can’t the same be done with railroad property so the trail can be built where it was originally proposed? I think it’s about time that those R/R barons be told it’s the 2000’s & NOT the 1800’s when those land grants were given out. The R/R’s never have developed much of a public transport system which as I recall was one of the conditions for receiving those liberal land grants. This set in stone right they have about we the public are crossing their “property” needs to be reconsidered for our present times. 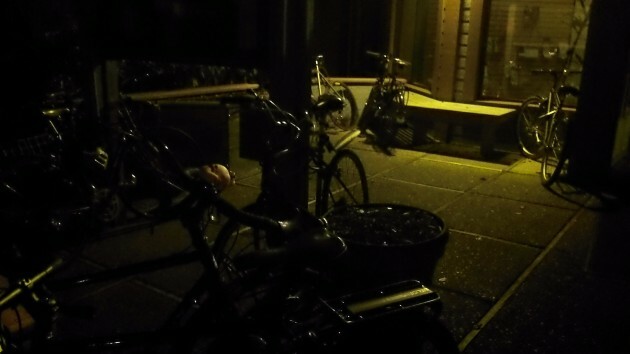 This bike path is far overdue to connect these two bike-friendly communities and I appreciate HH’s coverage so far. There’s probably better process that could have been involved than what happened here (although it’s hard to say that it’s required). Granted, it would just be more of everyone shouting “it would be better and cheaper if this were put over there and not by me.” But that’s public process, and even if not everyone can get their way, it’s important that they be heard. But at this point, I hate to say it, but I’m okay with the government “ramming this down our throats.” Yes, it will probably require eminent domain and some lawyer and not everyone will be happy about that. And it’s unfortunate but unsurprising that it’s easier for the county to get its way when fighting with private landowners than the federal government. But frankly its an important project and this is what governments do, people get upset, move on, and adapt. This bike trail needs to be finished and going back to the drawing board too many times won’t help. I’m opposed to this bike path for the simple truth that it’s an absurd waste of public monies. Not at all cost effective and those cyclists supporting it should be ashamed of themselves for their self-serving stance.